Yes, I said, Clean Eating Chocolate Bars. Now aren’t you glad you read this blog? And guess what, they’re easy to make too! But thank me later. Right now, you need to get into your kitchen and make a batch of these puppies. Cause Da-ANG they are good! And what I noticed most was that 1 bar was plenty. I didn’t crave another when I was done. It was very satisfying. They are a tiny bit softer than your normal chocolate bar. In fact, I stored mine in the freezer. I think using a bit more cocoa powder next time may help with that. But these are just so good the way they are, that I had to share! I should mention that this recipe is not my original recipe. You can find it in a few places on the web, namely here and here. I took the basic recipe and ran with it, adding my own flavors. 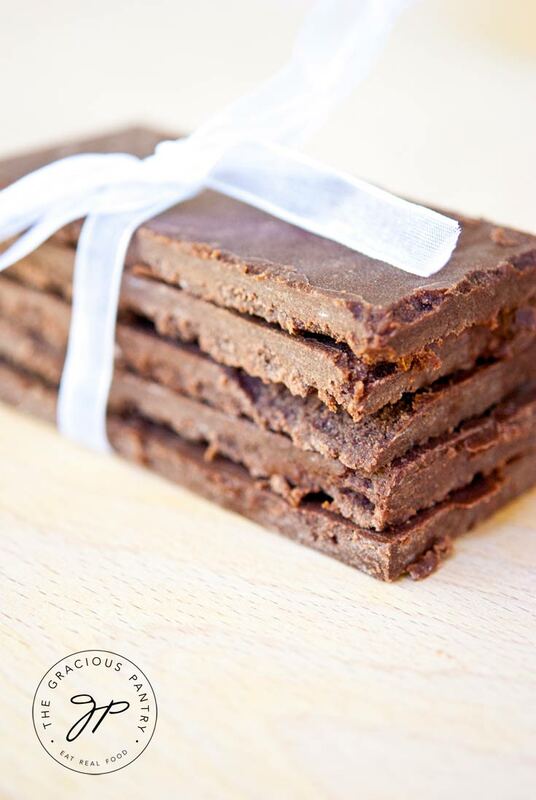 This delicious spicy twist on good ol' fashioned chocolate bars definitely ups the wow factor on these. The spices are, however, completely optional. In a medium sized pot, combine all ingredients. Whisk well over low to medium heat until the chocolate is smooth. You want to get rid of as many of the clumps from the coconut oil as possible. Spread out over a parchment lined cookie sheet and chill in the fridge or freezer overnight. Note: I used a professional size quarter sheet for my cookie sheet. This is half the size of a normal cookie sheet. You can use any container you like that will allow the bars to harden flat (unless you are using a form). Do you think this would also work with carob powder? I don’t see why not. It’s worth a shot! yummyyy, I wonder if i can make a faux almond chocolate bar! cocoa and cayenne-oh yummmm! I once (ok more than once) had roasted coffee beans coated with chocolate and hot pepper-so good. So are they like chocolate cookie bars or chocolate candy bars? Either one sounds scruptious. They are just chocolate bars. Like a Hershey bar, only they taste different than a Hershey bar. These look great! I love finding sugar free treats! It will work. Mine was the same way. Do these taste like coconut, or do you use a refined coconut oil? No, I used raw coconut oil. There is a slight coconut flavor, but it’s not overpowering. I’m not sure that would work very well. But you could try it. Hi Tiffany! I was introduced to your blog yesterday! Love it! Thanks for all that you do here for us to read and try ourselves! I tried this recipe just last night with organic extra virgin coconut oil and when my husband (who doesn’t like coconut) tasted them, he tasted the coconut. I didn’t add the cayenne, so would that mask the coconut oil more or is there another ingredient that I can add to disguise the coconut taste? Thanks again! It’s hard to say. The Cayenne does help, but you could also try orange or lemon extract. You could try black pepper, but I would just leave it out all together. It could have been the brand or type of oil? Honestly, I’m clueless here. Did you measure everything correctly? Did you change anything? Oh wow I just whipped these up and they are delicious! I am a chocoholic and this is us up there as one of the tastiest chocolate treats to have passed my lips. Wonderful!!! I’m glad you enjoyed it! Hmmm…. okay, let me know how it turns out. Definitely! Only, they will melt much faster than regular chips. So you’ll need to chop, freeze and add at the very last minute before baking. Cacao butter (food grade) will work instead of coconut oil. It’s a little harder when at room temp, but melts quickly in the double boiler. I found some at Natural Grocer, but I bet you can get some on Amazon. Erin – Great idea! Thanks! I thought I couldn’t love you any more after the Lemon Chicken Carbonara, but you’ve outdone yourself with this one!! Unfortunately, I can not stop eating them!!! But I don’t care! Haha!!! Oh dear. Well I’m glad you like them! Coconut oil is very healthy for you. I cook with it often. I also use olive oil, walnut oil, sesame oil and safflower oil. But for this particular recipe, coconut oil works best because it hardens when cool. Otherwise, you’d just have chocolate syrup. That’s what I love about these bars. A little goes a long way! These particular bars are pretty dependent on the coconut oil. But you can always order it from amazon.com. You’d probably get a pretty good deal on it that way. I drove into the city to buy some. I see why we need it! I didn’t realize that it’s a solid a room temperature! I made it last night – it’s very good. Its very soft though. I think I’ll add some more cocoa for next time, or cut back on the oil a bit. Thanks for the recipe! I’ll be coming back to this one! Made these last night and tried one today – SOOO good! Usually I don’t comment on recipes and such, but I enjoyed these more then regular old chocolate! Awesome! Glad you’re enjoying them! I just made these and they haven’t hardened but OMG they are FANTASTIC! I didnt have chili powder and forgot the salt but they are still SO good. They would be great to dip fruit in before chilling. Yes, fruit is great to dip in this while it’s warm! can u tell me why after stirring for a bit my ingredients separated or thinned out? I though maybe temp so I put them in the fridge they froze but with a whitish film on top. Not sure what you mean by separated. Did the oil not combine with the chocolate somehow? The white film on top would have been the oil or fat rising to the top. So something definitely did not combine well. What types of cocoa powder and oil did you use? Louann pure coconut oil and herseys unsweetened coco powder…. I heated the oil in the microwave for 10 sec to make it softer for stirring… Could that be it? everything combined fine at 1st but I kept stirring for about 5min and then all of a sudden the mix thinned out … Kinda like gum after u chew it too long. So I rushed it to the freezer…. It doesn’t taste bad…doesn’t look like your pic either has an interesting pattern where the oil separated… Like cream cheese swirl brownies! I got REALLY excited about this as it was listed under vegan recipes. It’s not vegan though! Honey is unfortunately an animal byproduct 🙁 Could you recommend a different sweetener perhaps? holy smokes these are awesome!! I used 100% cacao dark chocolate cocoa powder and had to make a few changes (be/c I didn’t have the ingredients) — I topped off the honey with some blue agave nectar, used vanilla almond milk instead of vanilla since I was out. These are just fabulous!! Thanks for the recipe!! oh and to the person wanting a vegan sweetener..blue agave nectar is vegan and a low glycemic index food! Crystal – But sadly, agave is not clean. 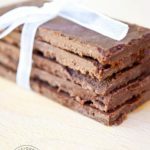 I am so grateful for this recipe- this is some of the best chocolate I’ve ever had! I’ve played around with the recipe and omitted the chili powder, cayenne, and cinnamon and replaced it with peanut butter…very tasty!! Oh…my! I put these together about 5 hours ago. I just couldn’t wait & cut a piece out. They were crunchy on top & fudgy on the bottom…YUM! Mine came out very coconut-y, which I really like. My only ‘complaint’, of sorts, is not spicy enough…will be doubling the cayenne next time. 😉 Thanks! Amy – Glad you enjoyed them! These are great! I sprinkled half the sea salt over the top in addition to some organic cocoa nibs I had on hand for a little crunch. The parchment lined cover of a 9×13 pan worked as a great mold. Stella – If you pack them up properly, they’ll be good for about 4-6 months. Great recipe, I’ve made 4 batches by now and me and my co-workers love them. I just realized the last one I forgot the salt, but I didn’t notice any change in flavor and I like the smoother texture anyway so I think I will nix the salt from now on. Maybe this is just regional lingo, but I would not call these “bars”; it has the consistency of a piece of fudge straight out of the fridge/freezer. Unless it’s straight out of the freezer I would eat it with a fork or it will melt all over your fingers. At (slightly warm) room temperature the consistency is almost like frosting, so I plan on using this recipe on a summer cake if the opportunity ever comes up. Kevin – Great! I love it when a recipe has more than one use! 😀 Glad you enjoyed it! It wasn’t until after I got hooked on these that I noticed how expensive coconut oil is, which this recipe obviously uses lots of. But, once I did the math the cost was not as high as I feared. For anyone who cares, based on local prices of $15 for a can of Bereans virgin coconut oil and $7-8 for a jar of raw unfiltered honey (the 2 most costly ingredients), this recipe costs me about $9 to make. I cut a batch into 12 pieces for $0.75 per piece, which I think is ok (not cheap or too expensive). I would love to make these, but I’m allergic to coconut. Can these be made with any other type of oil? Stephanie – Sadly, I don’t know of another oil that will solidify like coconut oil will. We absolutely LOVE these! We added oats to give it a little more texture. Two months ago I started eating as clean as possible, to feel better and lose weight.The great part is that one bar satisfies many different cravings for both my husband and me. Re choc bars. Its noy clean eating if it has cocco and honey. That’s a big no no for someone that on a clean eating diet. Kylie – How do you figure? Raw honey is perfectly clean, as is raw cocoa powder. Grant it, they are special treats, not everyday foods, but there is nothing unclean about them. I have just made these and they are in my freezer. Wowsers!!! I licked the bowl and that’s all I can say and also thank you!!!! I’m addicted to sea salt chocolate so I put a whole tsp of sea salt in and omitted the chilli (kids might not appreciate it!) but sprinkled some chilli flakes on the top of 1/4 of the slab. I’m very excited about making my own Chocolate! these were amazing!! I’m working on cutting sugar out of my diet but taking small steps! I’ve cut out refined sugar, and am slowly working on decreasing the amount of sweets I eat in general. These are incredibly satisfying with a small piece! I actually cut them into 32 pieces. Made these tonight and snuck a taste (or two) before they were fully hardened. Oh my, these are good!! I am out of cayenne but will definitely add that next time too. Yum! Now, to not eat the whole batch!!! Natalie – I thought that would be my problem too! But the good news is, a little goes a long way. They are very satisfying, so 1 bar is generally enough. I am assuming that I need to heat this while mixing. Is this correct? Can’t wait to whip these up tonight. I need a chocolate fix! Darlene – Correct. Keep the heat low. Thank you! I tried these, and OH my goodness! Love this! Now… self control. self control. self control. haha! Darlene – Haha!!! Ya, but thankfully they are rich enough that a little will go a long way. Enjoy!! Someone added oats- how much and how did you add it? That sounds really yummy! I’ve never used coconut oil. Do I measure it cold and then heat it while I whisk the ingredients together or can I liquify the oil first?? I LOVE your recipes! I make at least one per week, and have shared your website with all my friends! I have lost 40 pounds by switching to a clean eating lifestyle, and slowly but surely I am converting them all to clean eating! Thank you! I had a question about this recipe. My friend and I made fudge with coconut oil and it was awful! Just tasted like oily coconut. Is there something else you could sub for the coconut oil? I love Hershey’s bars, and its been hard to give them up! Susan – Not on this one. You need an oil that will solidify. I suppose you could try butter, but I have no idea how that would work out. I have to say though that these do not taste like oily coconut. At least not to me! Can I use wax paper instead of parchment paper? Also if I want to add peanut butter how much? Jennifer – You could, but wax paper is not the healthiest way to go. The wax particles get into your food. I wouldn’t add peanut butter to the bars themselves. I would just spread some on after they have been frozen. That, or layer the chocolate with peanut butter in muffin papers to make peanut butter cups. I made these today and they are good but very rich and more like fudge. Is that how they are suppose to be? Jennifer – Yes, they are very rich. A little goes a long way. I just made this recipe as their is an allergy to tree nuts in our home so I avoid them all and used with butter. They smell delicious and in the liquid form it is heaven. Cannot wait until it hardens some to let you know the final outcome. So far though they are amazing!! thank you for all of these wonderful recipes!! Nikki – Thanks! But if you have a tree nut allergy, wouldn’t that also include coconuts? Just curious. Don’t want anybody to get sick! Yes, We avoided them and used Butter instead of coconut oil. They taste amazing! EVERYONE in the home cannot get enough. Do you taste the chili powder? Do you have to use it? Christiane – No, you don’t have to use it. It gives them a little spice, which in hindsight, I would not do again. But they were good! I mixed carob powder & olive oil, for a lovely texture. Then I tried to add vanilla extract. Then it started to get rough & lumpy. Added honey but it doesn’t seem to blend. I scooped them into the mold anyway, Hoping it set later in the chiller. Will try another round later with only 1 tsp of vanilla extract & a pinch of salt. Elaine – It could be the carob. I’ve never tried it with carob. Try adding the vanilla after the honey and cutting it in half. Maybe that will help. Let me know how it goes! I’ve a girlfriend who loves chocolates. Who doesn’t, but after taking chocolates, she’ll release very stinky human gas. Hence I’m trying to use carob as a substitute. But the cocoa is not that strong & the vco is a bit strong. Any suggestions? Elaine – Maybe try adding some extracts? What’s the difference between essence & extract? Does chocolate/cocoa extract contain traces of cocoa? Due to some health reasons I have to avoid any kind of sugar subsitue. My doctor also forbid to eat fruit sugar or any other sweetener since all that feeds the Candida albicans. Basicly I can just eat vegteables and meat and stuff like that. So I am searching for alternatives. Do you think this recepy would work with any sweetener at all or would it taste too bitter? Gwen – It would be pretty darn bitter. Have you asked about stevia? Stevia is not a sugar at all and may allow you to have something at least moderately sweet. It’s worth asking your doctor about! Gwen – Great! I hope you enjoy it! Just be aware of the conversion between sugars and stevia. Stevia requires much less! !